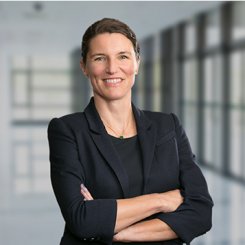 Christina Hultsch is chair of the firm’s Health Care Practice Group and a member of the International Business Practice Group. She focuses her practice on health care regulatory and transactional matters. Christina also advises clients on cyber-security risks and assists in addressing security incidents, ransomware attacks and post-breach response. What made you want to focus on health care law? There are really three things, all of which are equally important. First, health care’s regulatory framework allows me to use my German civil law training. Second, our health care practice is predominantly a business practice with a regulatory overlay. This means that, while training as a health care lawyer, I was also developing transferable skills which have been useful in other areas of the corporate practice. And last, but not least, health care is ever changing, no two problems are the same and the work in the healthcare arena is a constant challenge, which forces me to keep growing as a lawyer. Avoid limiting your career options until you have had an opportunity to explore and gain some experience in a certain area of the law or type of job. I had a far too narrow set of expectations of what my future would look like when I started law school. None of these ideas even remotely included a career in private practice and I would have never thought that I would enjoy it as much as I do. I am lucky that I arrived where I am today, but in hindsight, the process could have been much easier had I been a little more open-minded in the early stages of planning my career. It has helped in a number of different ways, but one stands out in particular. I still remember the challenging adaptation from a German legal system to practicing law in the U.S. I spoke English well, but mastering the legal terminology was not an easy task. I always carry this experience with me and try to think about how the words I use may sound to a client and make sure that what I am saying matches up with what the client is hearing. I grew up in Germany and moved to the U.S. in 2003, so selecting German Chancellor Angela Merkel as my dinner date may not be that surprising. She has had such an impressive career and is one of the most powerful politicians in the world. But, more importantly, she and I both grew up behind the Iron Curtain in East Germany, and I would love to compare notes on how that East German childhood has shaped our future. My life now is so vastly different from anything I could have ever imagined as a child and I always think that makes for a pretty good story at parties. Imagine having that conversation with Angela Merkel instead – how fascinating would that be?! That one is easy: it’s my mentor, Bob McAdams. His support has been one of the key factors for my success at Porter Wright. We both have very analytical minds, but he taught me to use these skills in a way that is most beneficial and helpful to our clients. Because of him and his years of mentorship, I have become a better lawyer and a much better advocate for my clients, and I am very grateful for that experience.